1. 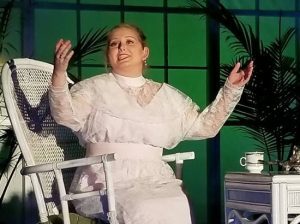 ‘My Fair Lady’ at Third Wall Productions. “Who knew that in a cute church in Towson, I would hear some of the best voices I’ve heard this year.” – April Forrer. Synopsis: My Fair Lady is a musical based on George Bernard Shaw’s Pygmalion, with book and lyrics by Alan Jay Lerner and music by Frederick Loewe. The story concerns Eliza Doolittle, a Cockney flower girl who takes speech lessons from professor Henry Higgins, a phoneticist, so that she may pass as a lady. Jessica Preactor as Eliza Doolittle. Photo provided by Third Wall Productions. 2. 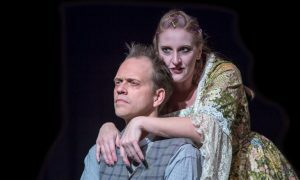 ‘Sweeney Todd: The Demon Barber of Fleet Street’ at Kensington Arts Theatre. “…a strong and dynamic representation of a heavily produced show that actually had something new and fresh to say.” – Kristin Franco. Synopsis: Sweeney Todd, an unjustly exiled barber, returns to nineteenth-century London, seeking vengeance against the lecherous judge who framed him and ravaged his young wife. The road to revenge leads Todd to Mrs. Lovett, a resourceful proprietress of a failing pie shop, above which, he opens a new barber practice. Mrs. Lovett’s luck sharply shifts when Todd’s thirst for blood inspires a new ingredient into her meat pies that has the people of London lining up… and the carnage has only just begun! 3. ‘In This Hope: A Pericles Project’ at The Welders: A Playwrights’ Collective. “. . . an experience that was warm, magical, intimate without being intrusive, and almost suspended in time.” – Mary Ann Johnson. Synopsis: In This Hope: A Pericles Project is part play and part ritual. Led by an all-female/multi-cultural ensemble, the production excavates the layers of the past to reveal something completely in the present. The story of being forced to flee a homeland, journey over the sea, discover love and experience great loss has been passed on since antiquity and still resonates to this day. With Shakespeare’s epic PERICLES as the starting point we come together, with our audiences, to uncover the power of memory and storytelling. Marina (Lida Maria Benson) bargains for her life with an audience volunteer in In This Hope: A Pericles Project from The Welders (Photo: Teresa Castracane) Photography. 4. 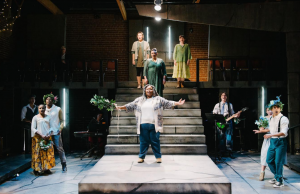 ‘As You Like It’ at Keegan Theatre. “…“As You Like It” is as close to perfect as any production that has appeared in Washington this year.” – Peter Orvetti. Synopsis: Named one of The New York Times’ best shows of 2017, Shaina Taub and Laurie Woolery’s musical adaptation of Shakespeare’s AS YOU LIKE IT is an immersive dream-like tale of faithful friends, feuding families and lovers in disguise. Forced from their homes, Orlando, Duke Senior, his daughter Rosalind and niece Celia, escape to the Forest of Arden, a fantastical place of transformation, where all are welcomed and embraced. Lost amidst the trees, the refugees find community and acceptance under the stars. 5. ‘Things That Are Round’ by Rep Stage at HCC. 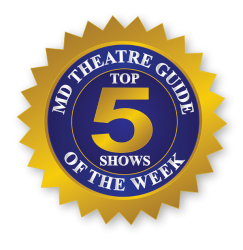 “If you like exciting, cutting edge theatre, this is a play you should not miss.” – Susan Brall. Synopsis: Tetherly, a dentist specializing in existential terror, and Nina, an aspiring opera singer who just might be the worst babysitter ever, square off in a strange ballet of truth or dare. But is this a game anyone can even win? 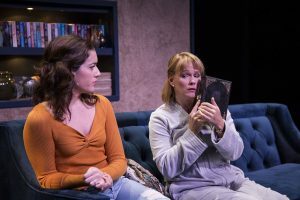 In Kimball’s dark comedy, a la Thelma and Louise meets George and Martha on steroids, “Things That Are Round” upends stereotypes and subverts traditional tropes of love stories, psychological thrillers, and the ‘living room drama,’ while exploring the lengths we will go for human connection. Thais Menendez and Beth Hylton in ‘Things That Are Round’ at Rep Stage. Photo by Katie Simmons-Barth.